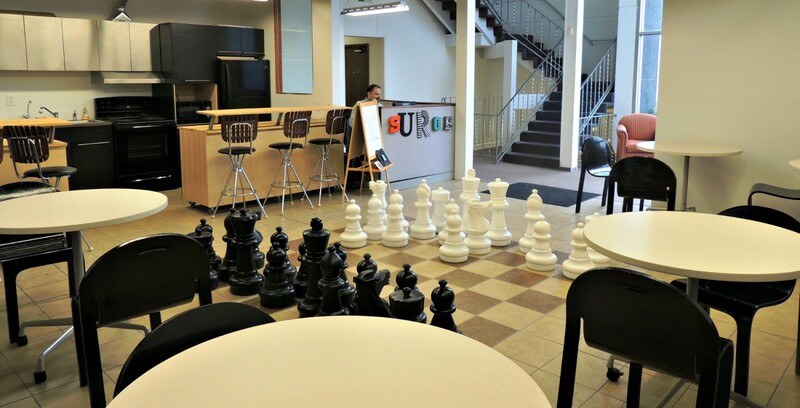 SURGEtacoma empowers startups, freelancers, entrepreneurs, students and non-profits by providing state of the art offices and coworking space, freeing up members time and energy to focus on their goals. SURGEtacoma helps individuals and small companies reach their full potential by providing them with an inspiring, high-tech environment minus the mundane distractions and isolation of a home office or small secluded office space. We offer a large presentation space, a fully stocked giant kitchen, rooftop view garden (with wireless reception) high speed internet, wireless, networked solutions for your printing and copying needs, mail services, conference rooms, along with free coffee and tea, inspiring coworkers, meetups and seminars that make working so pleasant, it’s hard to leave! We offer all the benefits of working in an energizing high-tech startup type office, with no long term commitment, a low monthly cost and a minimal set up fee. You take care of your business; we take care of the rest.